Both neocons and liberal interventionists alike have united to slam the anti-war progressive as "Assad's mouthpiece in Washington" and an "Assad apologist" and of course there's the customary “Putin puppet” slur — the latter because as journalist Michael Tracey puts it, she "hasn't been sufficiently Russiagate-crazy for Democrats". The former charge was regularly sounded after her early 2017 trip to Damascus to meet privately with Syrian President Bashar al-Assad in a diplomatic gesture to personally investigate the West's regime change efforts and its consequences for the Syrian people. The move was slammed by fellow Congressional Democrats, who raised questions over possible violation of the Logan Act. 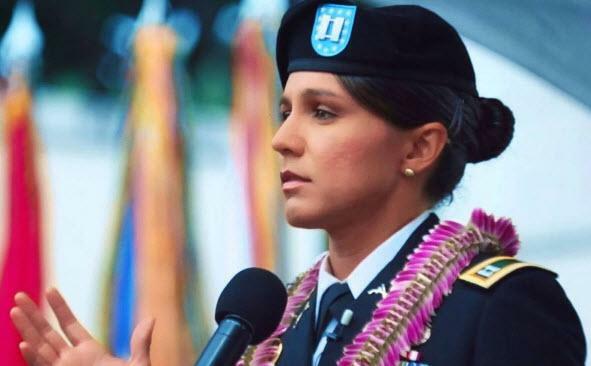 Funny enough as a mixed race far-left congresswoman (of American Samoan descent), Hindu, and US Army reserve officer one would think she would be lionized by the left given her "impeccable identity-politics bona fides". But her unforgivable sin? She's long made it a central goal of her political career to "end America's interventionist wars of regime change that have cost our nation trillions of dollars and thousands of lives," for which she's introduced Syria-related resolutions in Congress toward that end. She's also accused Washington's covert regime change efforts as fueling the rise of ISIS and playing "the protective big brother of al-Qaeda and other jihadists" — a charge repeated just two days after the last nation-wide 9/11 remembrance from the house floor. Considering that Congresswoman Gabbard herself is an Iraq war veteran and current Army reserve officer who served in the aftermath of 9/11, it's all the more powerful and rare that a sitting Congress member would make such forceful comments exposing the hypocrisy and contradictions of US policy. No doubt, this alone will send the beltway zero skin-in-the-game armchair hawks and theorists into foaming at the mouth rants of Gabbard "endangering our national security" should she ever get anywhere close to clinching the Democratic nomination. Having personally experienced the ravages of one regime change war and its lasting consequences for both common Iraqis and the American people, she's emerged as a "Ron Paul of the Left" of sorts (strictly speaking on foreign policy that is). And like Paul before, she could emerge in 2020 as a rare voice spotlighting Washington's addiction to regime change and "endless wars" abroad, and the military-industrial complex's fueling America's "global policeman" mentality, and its blindly obedient cheerleaders in the mainstream media. This will at the very least make the foreign policy debate during the next election — usually a mere single point of view establishment echo chamber — more interesting. In the meantime, what does the virulent hatred of Gabbard's anti-war stance reveal? As Nassim Taleb summarized: The "left" is just as owned by weapon makers as the "right".